This is the follow-up to the book Three, which was by far one of my best reads of last year, and this one is taking it's spot as my favourite read for this year. In Three, the child Wren and his drug addicted dying mother Cass are on the run, and find themselves under the wing of the titular Three, a lone gunman who guides them to (relative) safety in Morningside Falls - but at terrible cost. 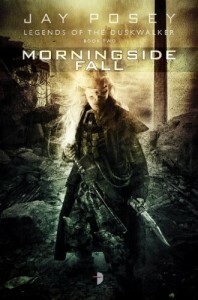 In Morningside Fall, Wren is now the titular governor of the city of Morningside but not everyone is happy about it. Between a city council that expected him to be malleable and play the figurehead, his having allowed the rabble that had been living outside the city walls to come inside to safety, and his uncanny ability to awaken some of the weir, there's a lot of unhappy people around and some of them have the ability to make life very difficult for Wren and his beloved mother Cass. I was a little apprehensive that without Three around, and with the antagonist Asher apparently defeated and Cass and Wren starting out in a relatively comfortable position, I wouldn't enjoy this book as much, but I was wrong. Wren is in a completely untenable position, a literal child who despite wisdom well beyond his years in a lot of ways, often doesn't understand the politics and motives of those around him as they try to manipulate him. So he is on the run again, this time with a whole team, trying to get back to one of the few places he ever felt truly happy. And everyone knows you can't go home again, so I don't need to tell you how that turns out. There's all the things I liked from the first book - the sparse but incredibly evocative, almost visceral descriptions, the loveable but deeply flawed, even tragic characters. The way everyone is beaten down, exhausted by their ordeals - nobody here is running for 20 kilometres but still up and ready to party right after. People who are hurt, are hurt, they even die, they feel pain. There's still no explanation how the world got the way it is, and I like it better for that. We don't need to know, the characters don't know either, and can't answer. Nobody, not even the weir or the awakened know what the weir really are, so how can we the reader? I can see that not sitting well with some readers, but for me, it's as it should be. I'm sure if Wren ever figures it out, we'll find out right along with him. But mostly, it's just so flat out well-written, I could turn around and read both books start to finish again just to savour them. The new characters do a fine job standing in for Three, but it's a testament to him that it takes a half dozen of them to achieve what he did alone, and in the end, they still can't quite. The repeat characters remain true to themselves as written in the first book (a pet peeve of mine when they don't!). Cass is still an interesting character - despite her enormous abilities, she is mostly passive, and when she stands up for herself (or finally goes into action in a fight) everyone is surprised, including Cass herself--but not Wren. As for Wren, while a little fey and full of surprises and as yet untapped power, he could have easily been a miniature Marty Stu, but he's not. Posey manages to write a child who despite being possibly the saviour of the world has a child's reactions to things: He believes what adults tell him, he understands when adults are just being polite to him--but not why, he trusts, he has overwhelming faith in his mother and that "doing the right thing" and being good will fix everything. You can feel his frustration with his small physical size, they way he's upset over something as small as tripping over and grazing his chin. And he's afraid--still enough a child to want to sleep in his mamma's room after the things that go bump in the night turn out to be carrying a knife. Once again, the ending has everyone in fairly dire circumstances, and there are characters we're probably not going to see again, albeit not as gut-wrenchingly as the first book. And the set-up for the next book is clear.